This month we’re supporting the campaign for stricter labelling of shark meat on menus. Currently, it hides under alternative names such as rock salmon, huss, flake and dogfish, making it easy for people to consume shark unknowingly. A good example is spiny dogfish. Once the most abundant dogfish species in the world, it is now, thanks to overfishing, critically endangered in UK waters. It is also classified as a fish to avoid on the Marine Conservation Society Good Fish Guide. Despite this, it often features on chip shop menus, but not as spiny dogfish, as rock salmon. A title also given to other shark species such as starry smooth-hounds, nurse hounds, and even blue sharks. Another example is mako sharks that often sell as “ocean fillets” or swordfish, which is more marketable and profitable. They are currently vulnerable on the IUCN Red List for Endangered Species. Shark can also be mislabelled completely and sold as cod or plaice. 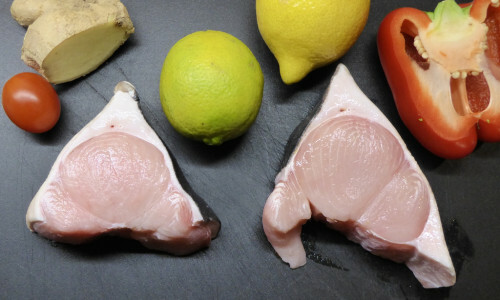 Transparency in labelling of shark meat would ensure everyone knows what they’re buying and is thus able to make informed decisions about the sustainability of their dinner.